One of Dharma Voices for Animals’ main purposes is to influence dharma centers to incorporate practices that reduce animal suffering. Since there are countless such centers throughout the world, we cannot possibly do this on our own. We need your help! To achieve this goal, DVA has implemented our Eyes and Ears program. Through this program we ask DVA members and other members of the dharma community (if you’re not a DVA member, please join by clicking here) to alert us to practices at dharma centers and other Buddhist institutions that may be causing harm to animals. We will then proceed in one of two ways. Either we will contact the institution privately ourselves to express our concerns and hopefully work with them to remedy the harmful policies and practices. Or, we will assist either you or another person who is familiar with the institution in working with them to effect the changes. If you are familiar with a monastery, temple, meditation/retreat center or any other dharma center, your help is essential. By being our Eyes and Ears, you provide us with the information we need in order to make contact with that institution. The process is easy. Simply download our Eyes and Ears form in PDF by clicking here. 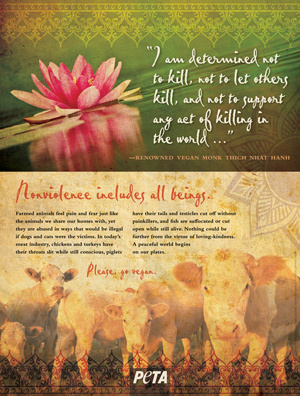 After downloading the form, fill it out, and return it to us either by email, to eyesandears [at] dharmavoicesforanimals [dot] org, or by regular mail to: Dharma Voices for Animals; PO Box 508; Solana Beach, CA 92075. Once we receive the form from you, we will make contact, or we’ll work with you or another in making contact, with the center. At no time will we give out your name to anyone without your permission. It will remain confidential. Also, since our goal is to promote change and not to embarrass any institution, our communication with the center will not be listed on our website or anywhere else (unless a center which makes a positive change would like us to announce it). It is essential that our interactions with dharma centers be positive and supportive, rooted in trust and compassion. Consistent with DVA’s philosophy, which is always grounded in the Dharma, we believe in cultivating honest, respectful relationships.